There's a certain thrill to a game that punishes you for attempting to best it, as Bloodborne and Souls series fans can attest to. That's why there happen to be so many of them cropping up here and there, especially over the last few years. La-Mulana EX is a member of this special breed of titles; a throwback to the 1980s where a gaggle of our favorite games were stiffer than your favorite drink and tougher than the very nails you'd want to hammer into your head after a play session. 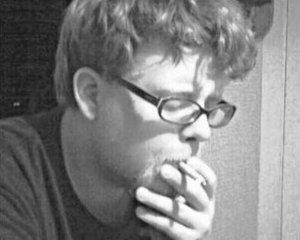 Originally debuting as PC platformer from Nigoro back in 2005 and flirting with Steam and WiiWare players over the last couple of years, its latest incarnation is indeed, as its publisher asserts, its greatest. 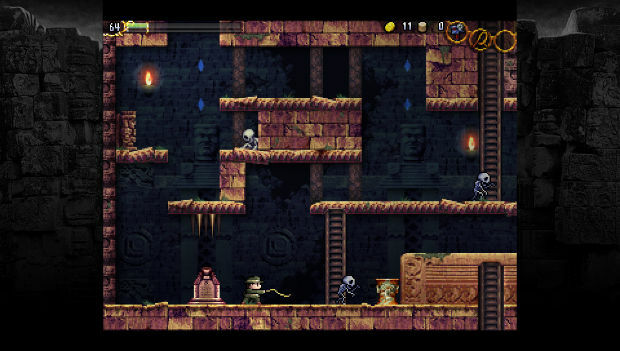 La-Mulana EX is considered the "ultimate" version of the platformer, with tweaked gameplay modes, an expansive Monster Bestiary, and more to create a modern appeal to the retro game lover in so many of us. Step into the shoes of Lemeza Kosugi, the diminutive Indiana Jones-like explorer equipped with a deadly whip and a thirst for adventure that can only be quenched by heading into abandoned ruins, staving off monsters, and solving each level's often frustrating and complicated puzzles. This is a platformer where dying and dying and dying again is absolutely guaranteed, but in some strange way that's what makes it so charming, too. Pygmy Studio's PlayStation Vita version speaks on gameplay tweaks and alterations meant to simplify and alleviate some of the frustration, but don't be fooled: this is still very much a difficult and challenging game. Every stone tablet you manage to reach in order to save your game feels like a victory, just as figuring out some of the more convoluted mysteries attached to several areas within specific levels. That's where the difficulty stems from, too: a lack of signposting and clear broadcasting of where and when specific events will occur, what you'll uncover if you happen to off a monster in a specific area, or a lack of information written on the many stone tablets nestled throughout the game. Of course, the monsters aren't just loitering; you'll need lightning-fast reflexes in order to fell a good number of them, and many will simply respawn over and over once you've already beaten them. This isn't so much a game in some areas as it is a test of endurance, but one you'll feel good about taking. Unfortunately, despite being given a new home on the PlayStation Vita, La-Mulana EX does not improve on or alter the original resolution of the flagship title and eschews additional functionality proprietary to the Vita for additional content like the aforementioned Monster Bestiary. The tweaks to the already unapologetically difficult gameplay aren't exactly evident, especially since many areas are just as enigmatic as ever, but the ability to look up the beasts you're up against can be useful. The game also lends itself well to a handheld format, as playing on the Vita makes things much less frustrating somehow -- at the very least, you can put the system down and enjoy the world around you when things get too annoying. 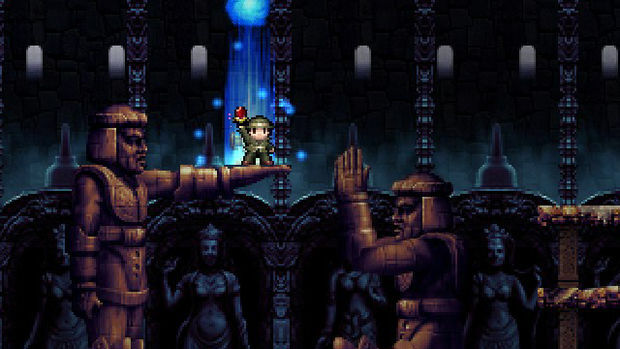 La-Mulana EX has found a fantastic home on the Vita, the home of the niche Japanese game and those looking for bursts of handheld play on the go. It's fast, furious, and in-your-face, but it's a good time. Plus, it'll liven up that trip to the doctor's office you've been dreading.